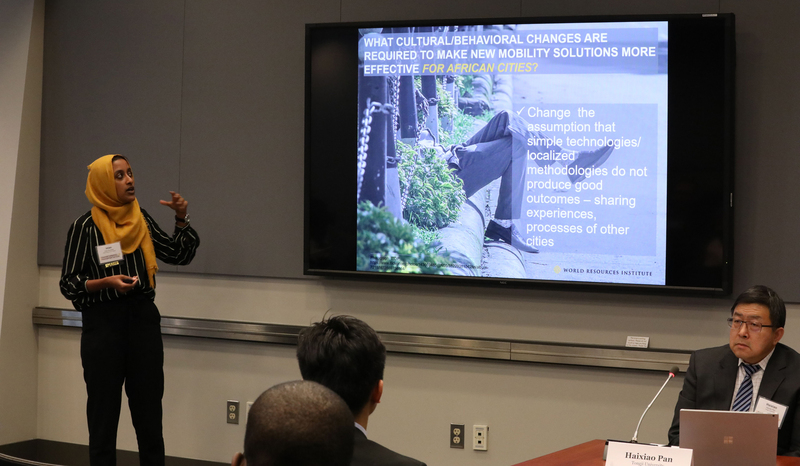 This was the overarching question for transportation planners and practitioners from developed and developing countries gathering at the World Bank headquarters in Washington, D.C. in January. Amidst “mobility’s second great inflection point,” over a thousand participants at Transforming Transportation 2019 explored ways to increase the mobility of people and freight, decarbonize transport, reduce congestion and promote sustainable development on a global scale. Integration is key: Public buses; private “microtransit;” ride-sharing apps like Uber, Lyft and Didi; bicycles; walking; e-scooter; shared streets; paved roads; de-carbonized energy production and land use policies are all part of the solution. Technology itself is not sufficient: While we delight in new four, two and even one-wheeled personal mobility vehicles, how we share our streets, how the pieces connect, how our mobility tools are powered, how that power is produced, how it’s all priced and who pays the price are public policy issues that must be addressed to guide the development of equitable and functional mobility systems. Smart public policy and government must provide the framework for the next generation of mobility. Across the globe, the allure of the private vehicle is strong: As the middle class grows, car ownership is a central aspiration and under current realities it may even be viewed as necessary for the economic advancement of families. To overcome this, “pooled” mobility services (i.e. train, bus, subway) have to be faster, cheaper, and easier to use, explained Mauricio Esteban Rodas Espinal, the Mayor of Quito, Ecaudor, where 73 percent of the citizens already rely on mass transit. Along with dense development, “dense transport” is key to reducing congestion, creating safer streets and combating climate change: As the world rapidly urbanizes, the greatest opportunity is for large and small shared autonomous vehicles (“autonomous rapid transit”) integrated with smaller, private “last/first mile” vehicles as needed. The greatest threat? A world gridlocked by “zero occupant vehicles,” which clog our roads waiting to be called by their private users. Partnership is the new leadership: No single entity has enough wealth, site control or power to grasp hold of this opportunity. Collaboration is key. The Shared Mobility Principles for Livable Cities is a founding manifesto for this new mobility collaboration and NUMO, the New Urban Mobility alliance, announced at Transforming Transportation that it seeks to implement those principles through innovative pilot projects, public engagement and experimental research in cities around the world. Zhao, X., Mahendra A., Godfrey, N., Dalkmann, H., Rode P., and Floater, G. Unlocking the power of urban transit systems for better growth and a better climate. Technical note. New Climate Economy, London and Washington, DC. Available at: http://newclimateeconomy.report/misc/working-papers/. USGBC’s close working relationships with building and portfolio owners is a powerful contribution to this mobility revolution. LEED-certified buildings are both a beginning and end point in the transportation system. LEED density in urban centers around the globe gives us the potential to make the right demands on policy makers. More immediately, we can use LEED’s market penetration to help build out urgently-needed EV charging infrastructure, as Building Green recently highlighted. Finally, the new LEED for Transit rating system positions us in the center of the global efforts to enhance the movement of freight by rail, which World Bank CEO Kristalina Goergieva told us at the Transforming Transportation welcome could reduce carbon emissions by 75%. USGBC’s global relationships with forward-thinking real estate developers and owners—and with the cities that house their projects—and our growing focus on building performance can help measure and aggregate the “transportation energy intensity” of our environment and leverage it to help deliver sustainable transport for all. Get started by registering your building for LEED 4.1 and your parking structure for Parksmart.